Homer's (I'm not talking about Homer Simpson!) poems refer to the food and drinks of gods as Ambrosia and Nectar. For us mere mortals & meat lovers, hamburgers might be the next best thing to Ambrosia. In the same line of thinking, Martinis might be the latest human attempt at competing with Nectar. Though very different, Hamburgers and Martinis have a lot in common. They both seem very easy to prepare and some people might be reluctant to consider them as "serious" food and drinks for the connoisseur. I, however, believe that they both are a lot more complex than meets the eye. There are probably millions of ways to prepare a good hamburger and the same goes for Martinis. Originally, the Dry Martini Cocktail was named Martinez but its evolution over the years led to the advent of the now famous (dry) Martini. Though not popular everywhere in the world (try ordering one in France and you'll be stuck with vermouth on the rocks), it is becoming increasingly known. 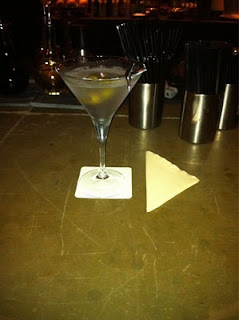 It looks very easy to prepare but the amount of possibilities make every single Martini a unique piece of art. 1) Extra Dry Vermouth: you can use half a spoon of it, or just wash the ice cubes with it or just pour it in the glass and get rid of it. Most American bartenders will actually not use it at all. 2) Gin or Vodka: that's up to you. The Original Martini is made with Gin. I like Vodka better though. Keep in mind that there are so many brands of high-end Vodkas nowadays that choosing the Vodka alone can be mind-boggling. As for me, I recommend to use Grey Goose Vodka. 3) Olives: stuffed or not stuffed? That is the question! My preference goes to blue cheese stuffed olives but, once again, it really is up to you. 4) Ice Cubes: Some say that the water used to make the ice cubes or even their shape can change the taste of the drink. 5) To shake or to stir? Once again, there is no definite answer to this question. 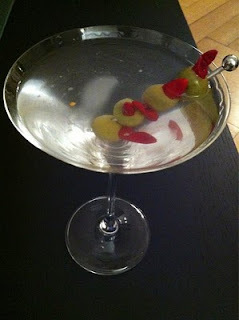 A shaken Martini will be colder but will have less flavor. And don't forget that some people also argue about which shaker to use! My preference goes to the Boston Shaker! 6) Martini Glass: Make no mistake about it: if you don't have a real Martini Glass then you shouldn't waste your time preparing this cocktail. You can't serve a Martini in anything else than a Martini Glass. That's it for this Martini 101 class! More to come soon! Stay tuned!